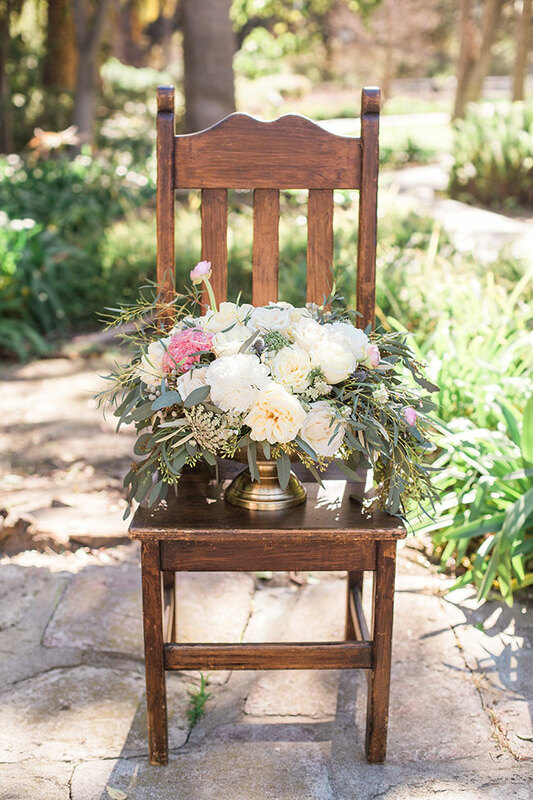 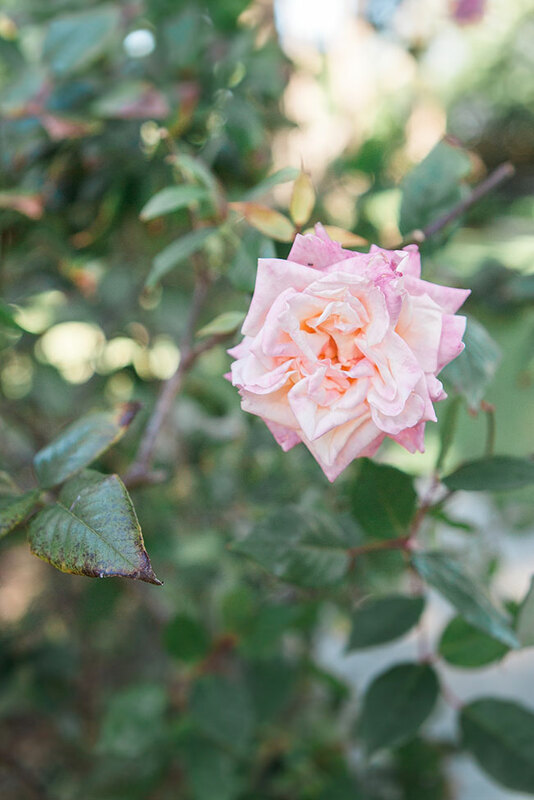 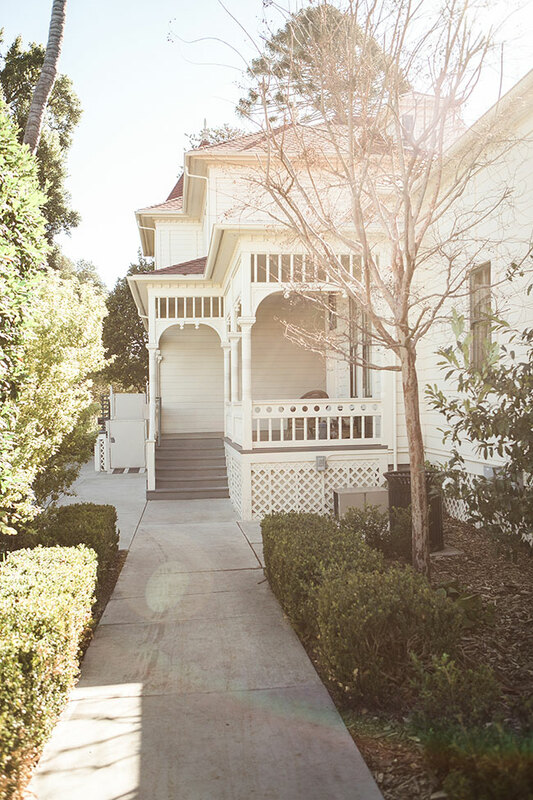 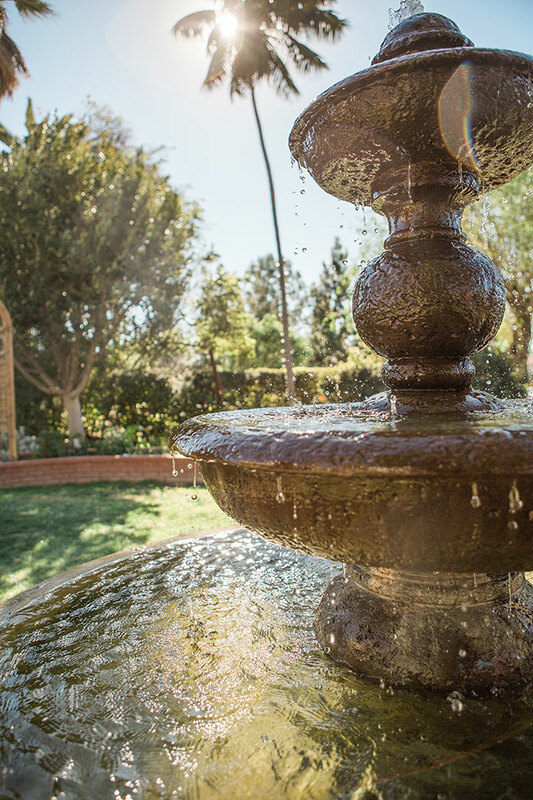 When you start off with a backdrop like the sprawling garden grounds of Camarillo Ranch, its easy to simply rest on the beauty that is around you. 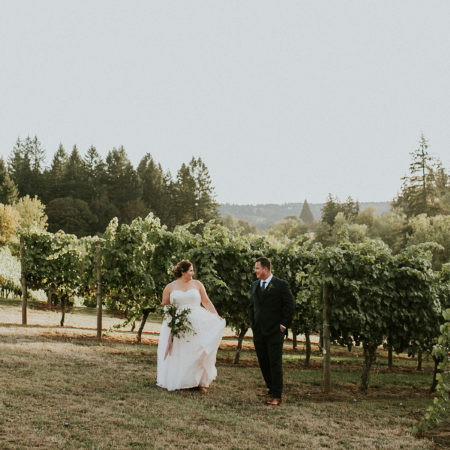 What many couple’s dont realize is that a stunning backdrop is simply the start, that armed with the right team you dial up your surroundings into a botanical wedding dream like no other. 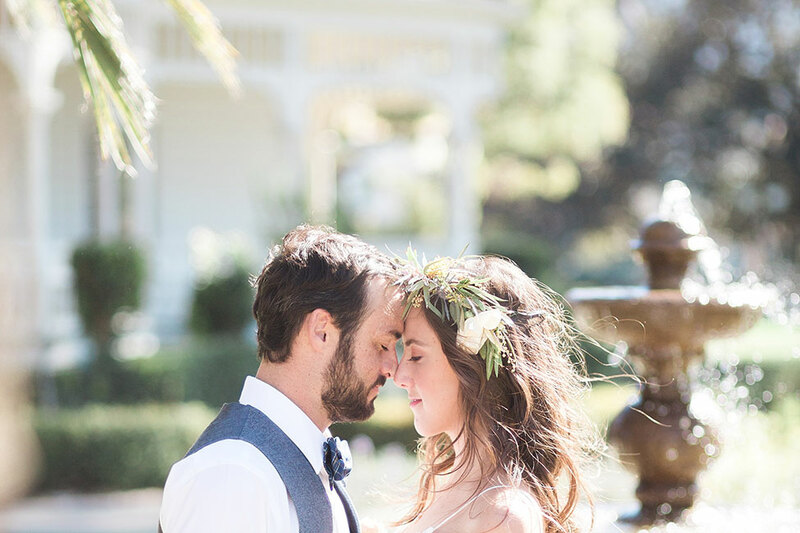 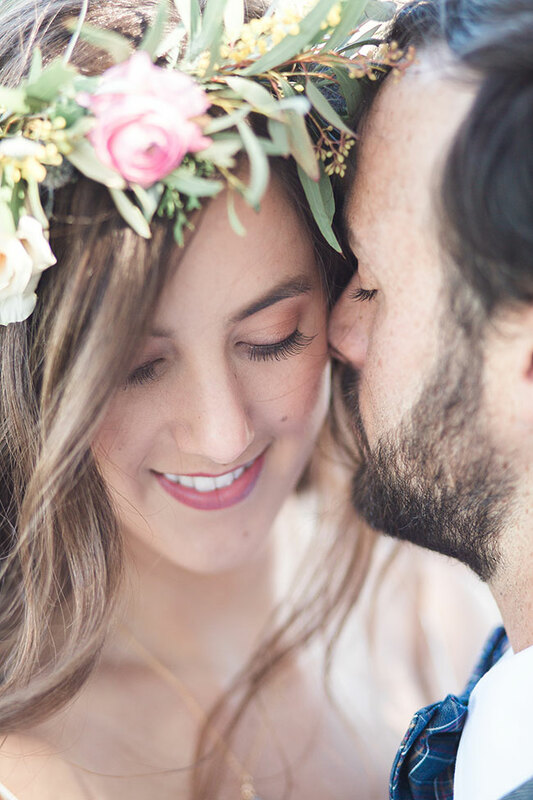 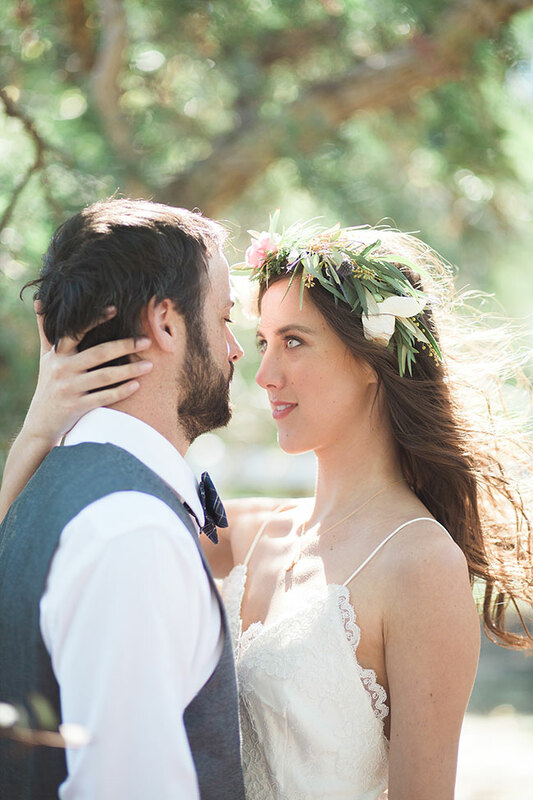 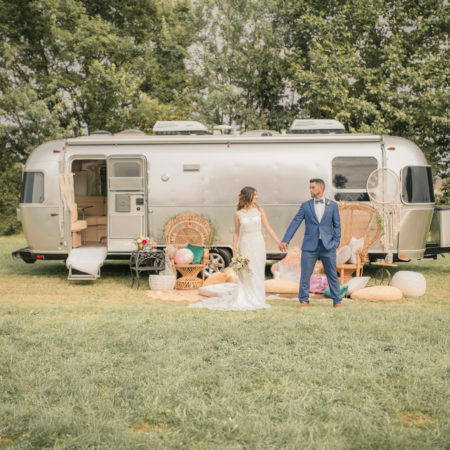 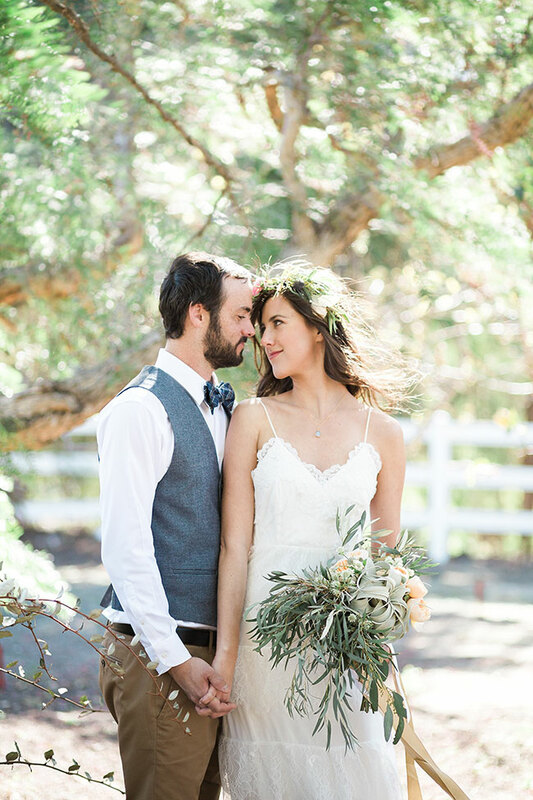 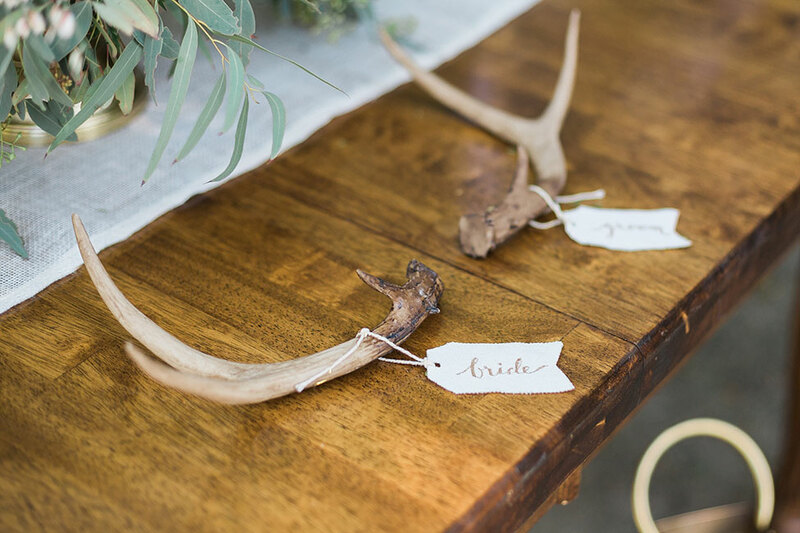 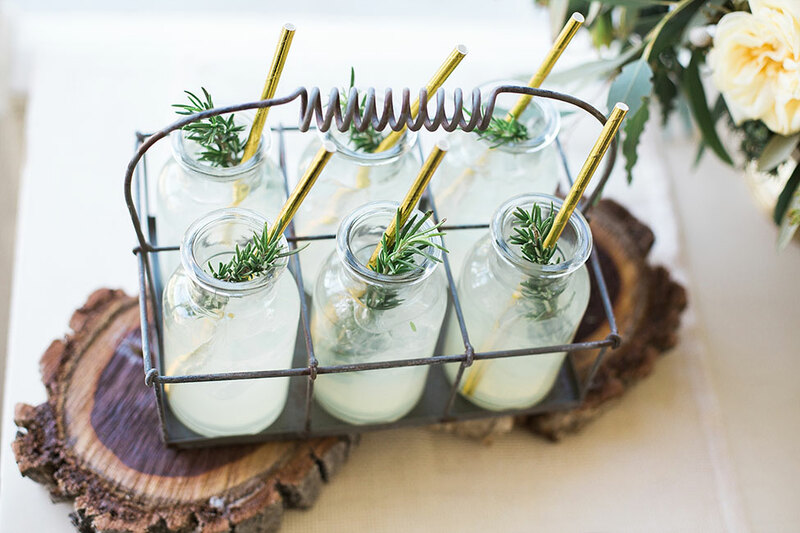 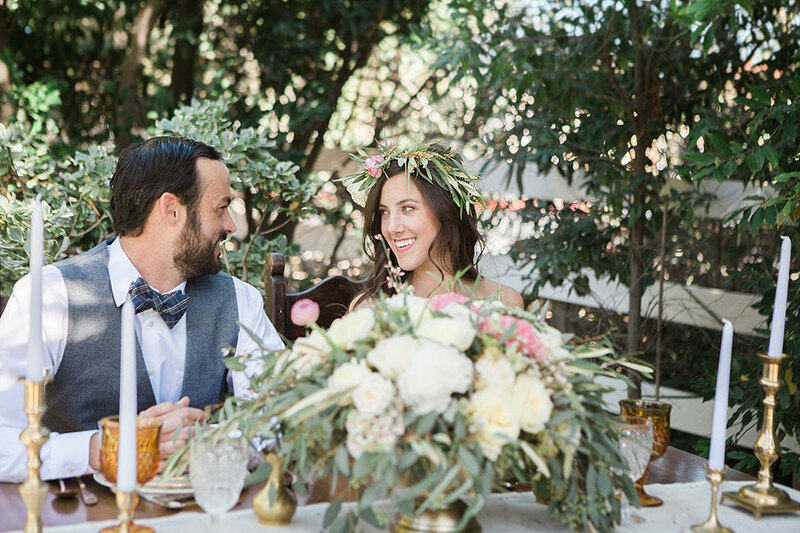 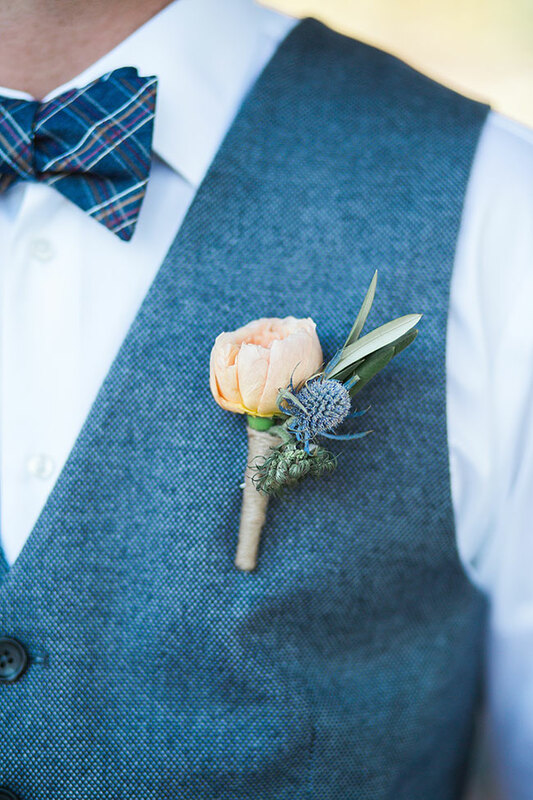 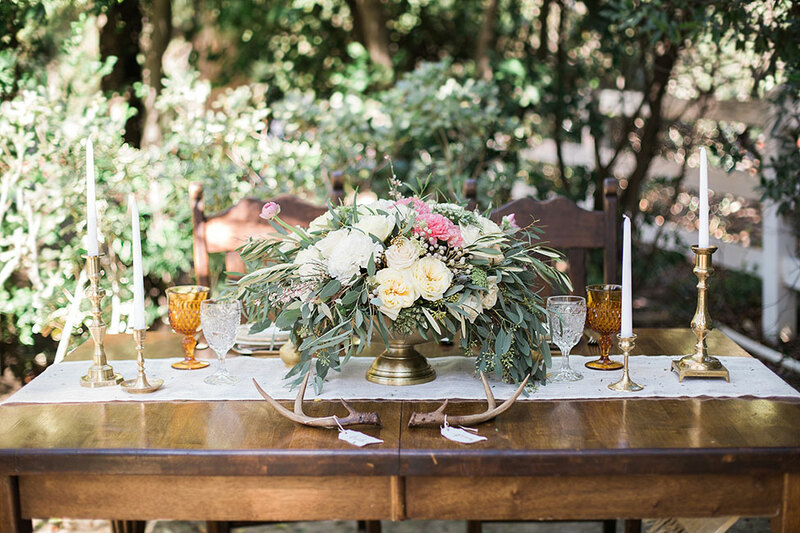 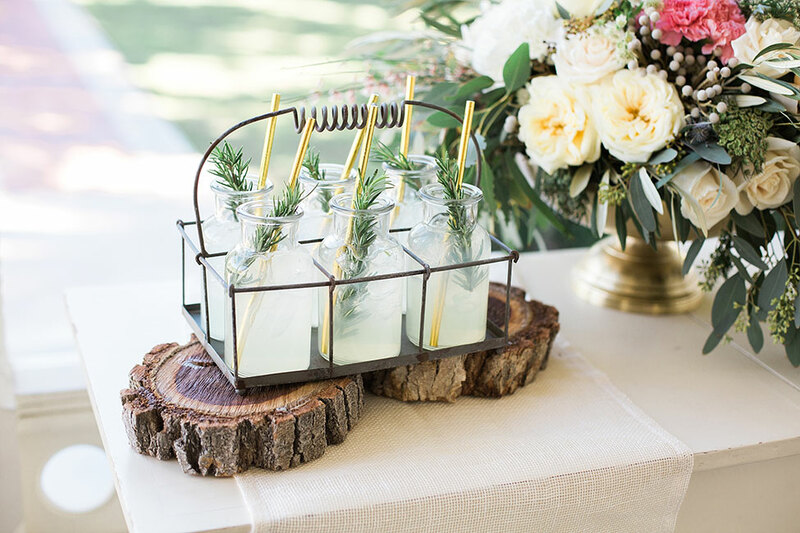 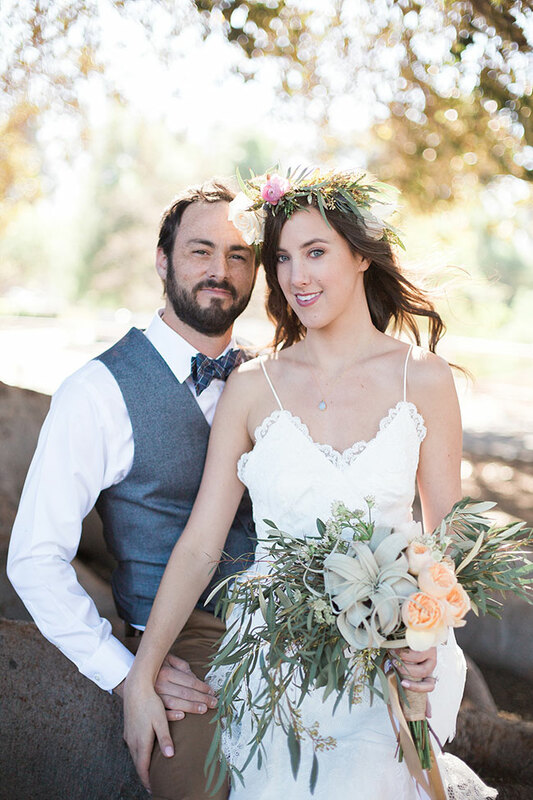 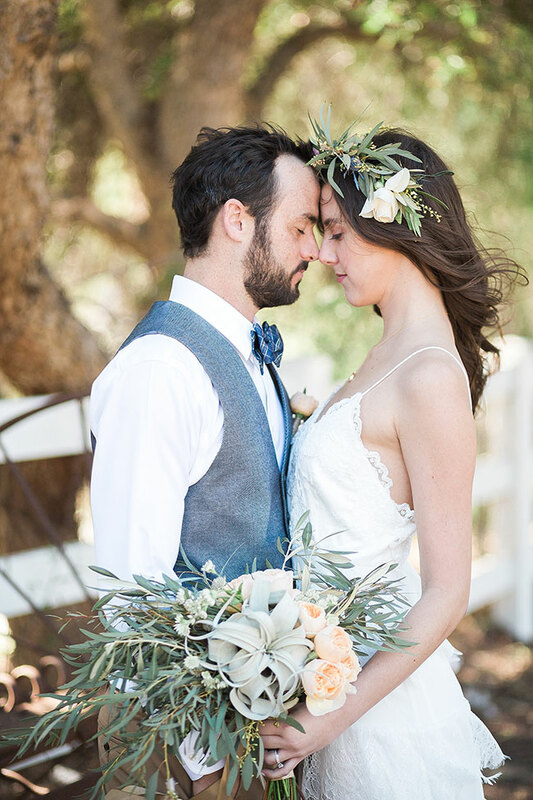 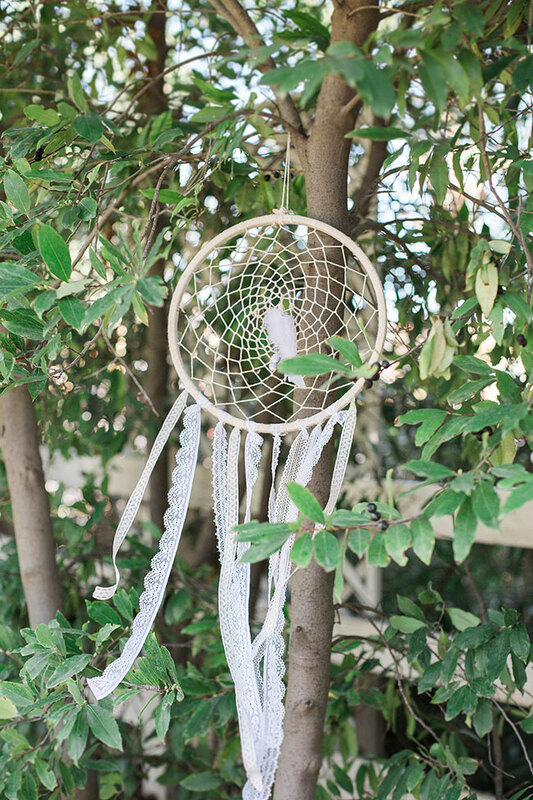 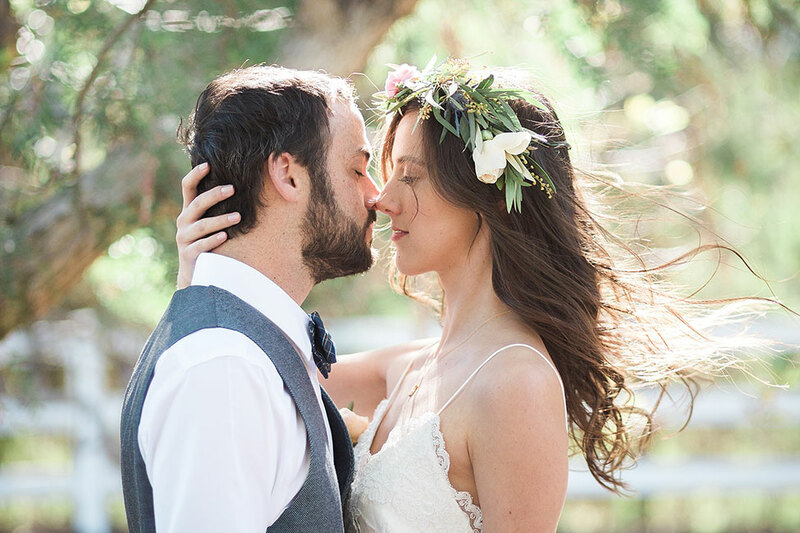 Inspired by the bohemian spirit, California wedding photographer Christy McCarter Photography, event planner Sincerely Jessie Events and Dish Wish Events along with the keen floral eye of Dulce Floral Design created the perfect boho botanical wedding that reads like a dream! 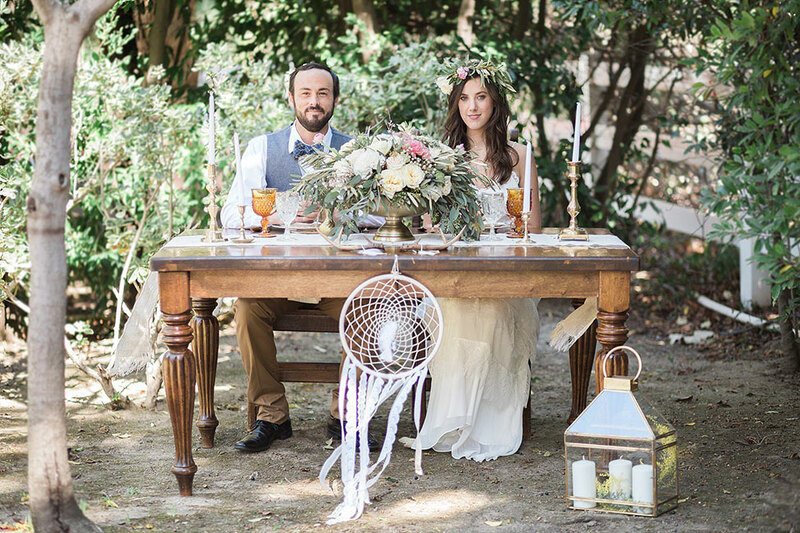 Details like a wild botanical bouquet, low back wedding dress with free flowing skirt, Gypsy style sweetheart table tucked away into the garden and so much more, its easy to swoon with each little piece. 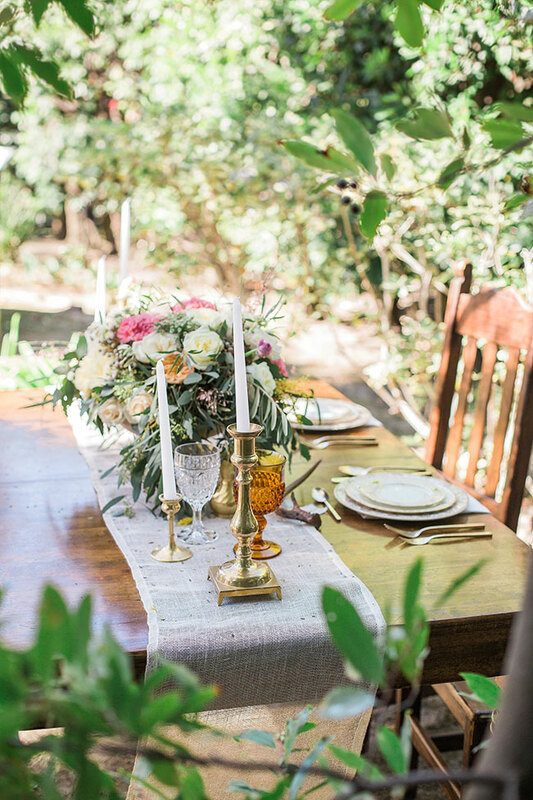 There is a reason that a bohemian vibe is so in favor, accent that spirit with botanical sensibilities and its utterly beyond! 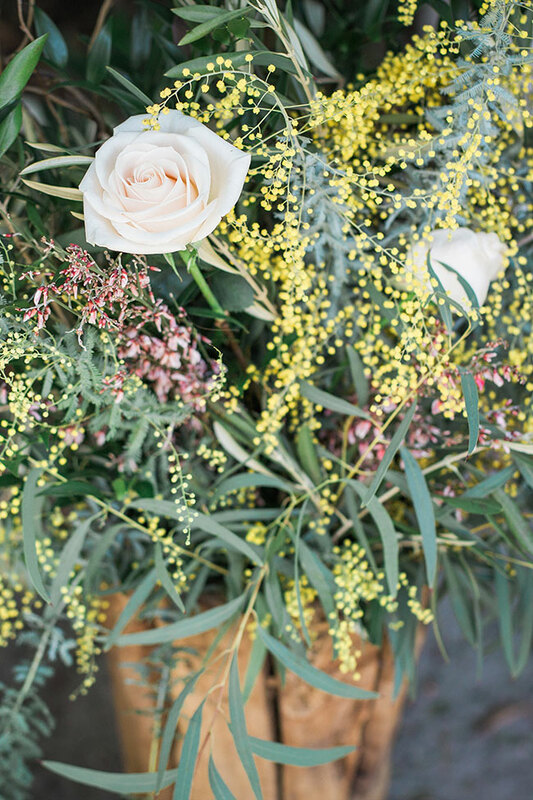 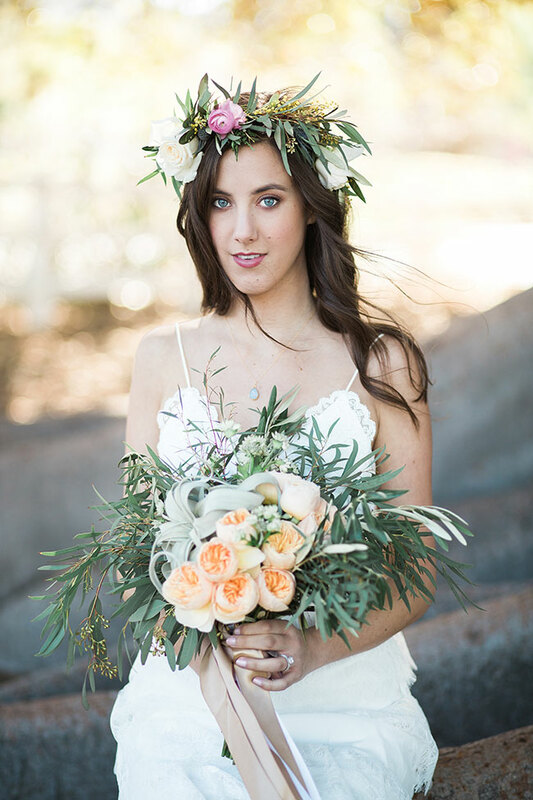 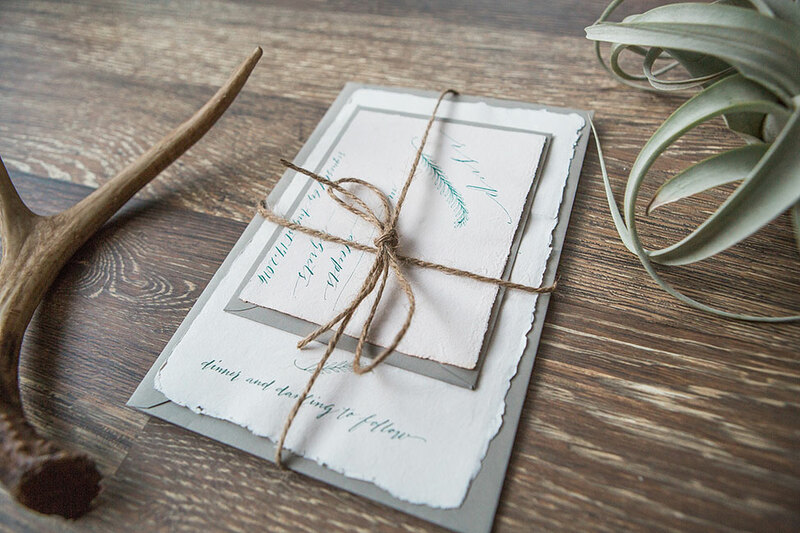 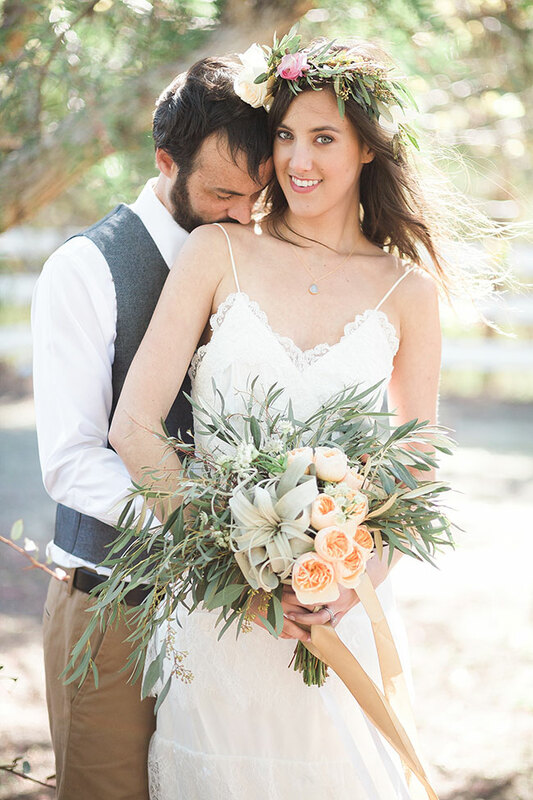 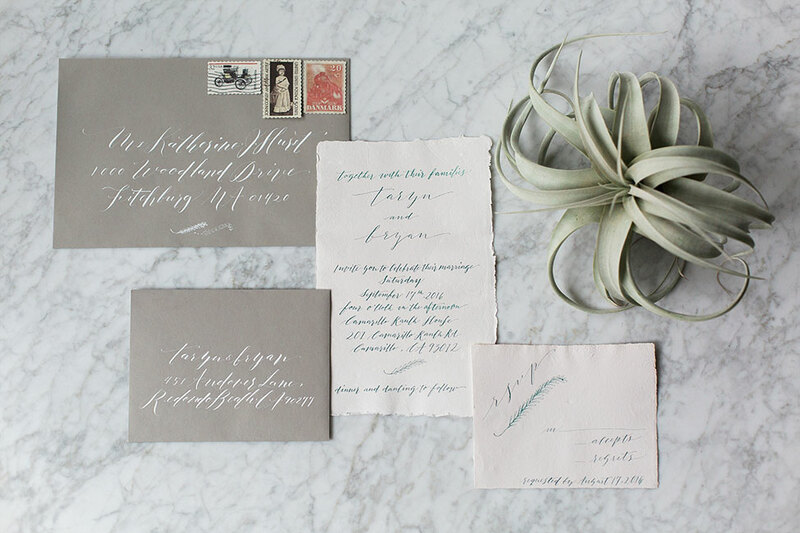 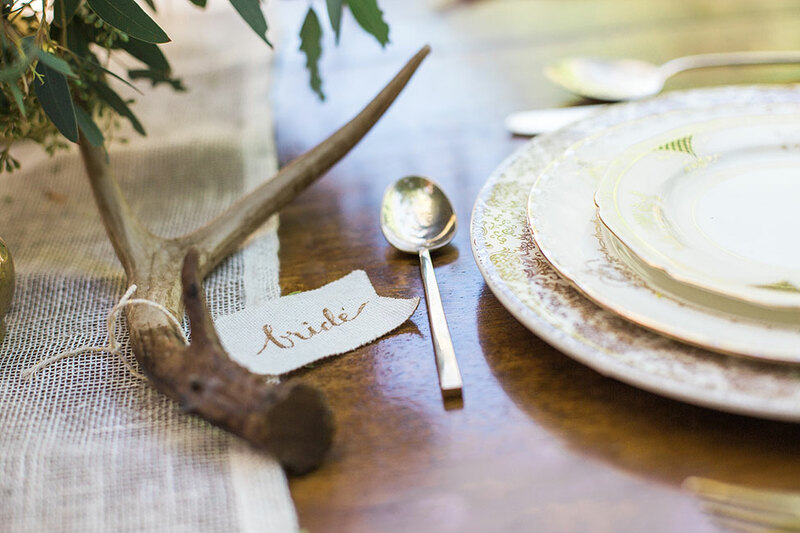 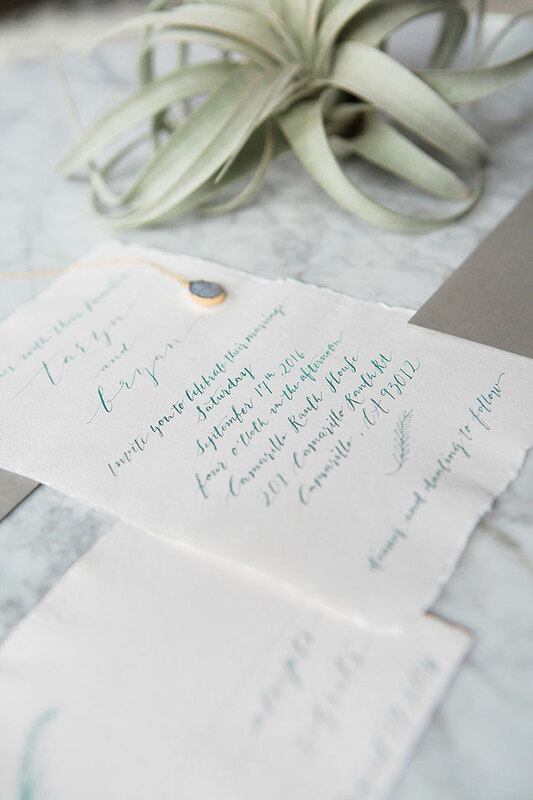 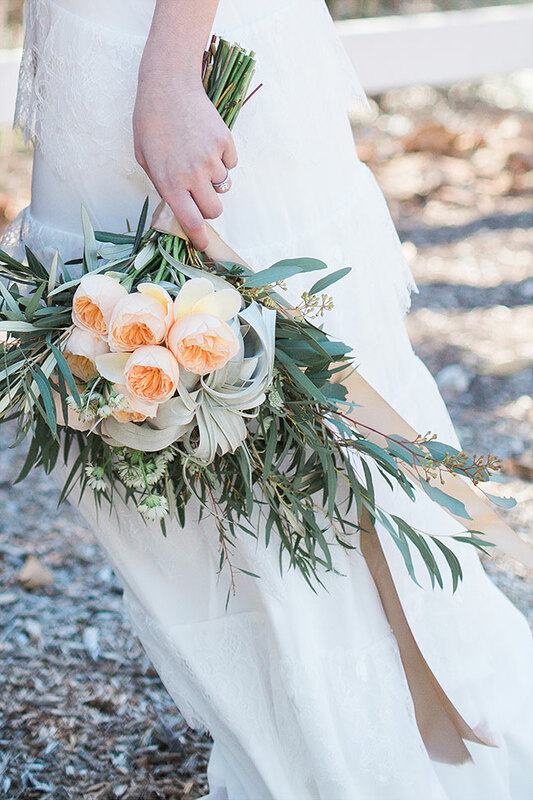 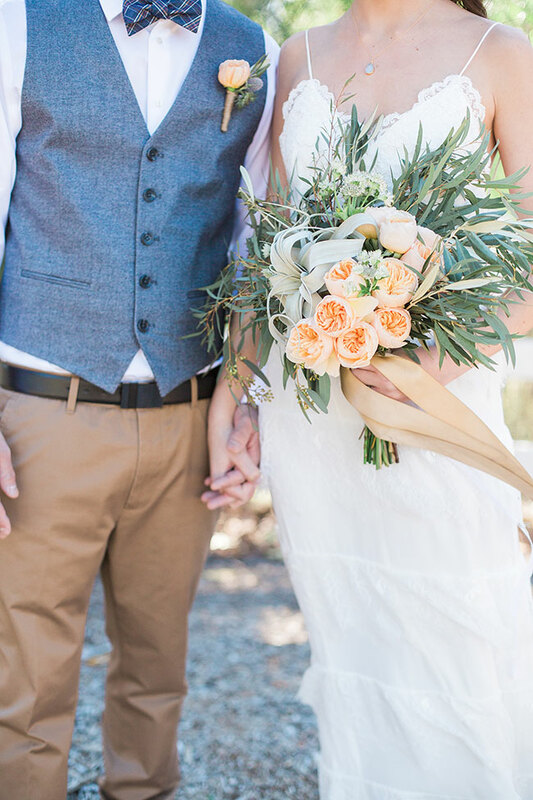 For this styled shoot we designed the look for a boho botanical inspiration, including elements of wild olive branches, eucalyptus, and light peach Juliet roses. 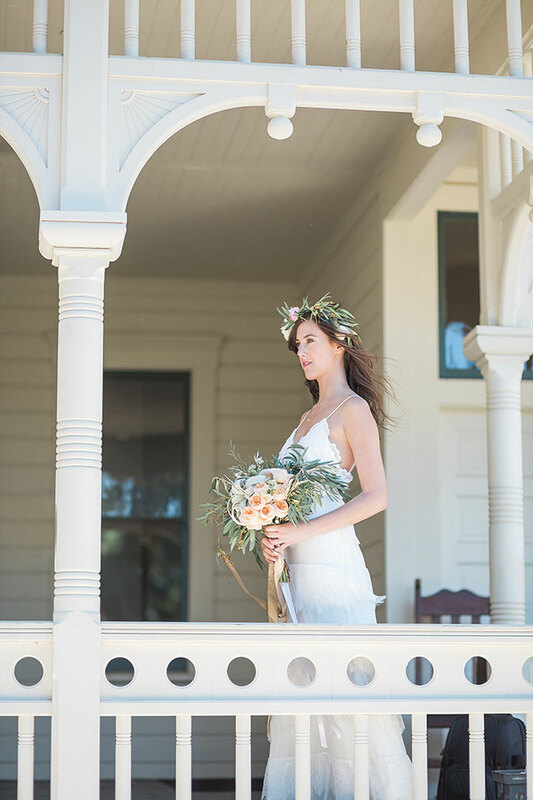 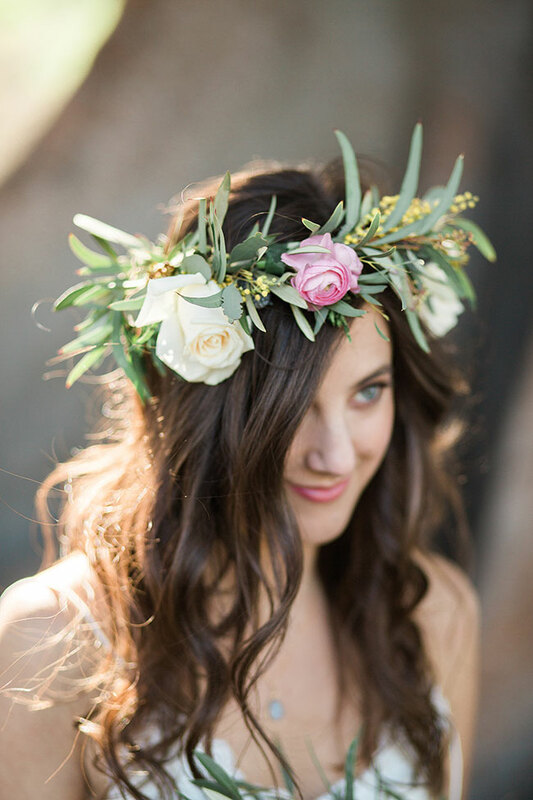 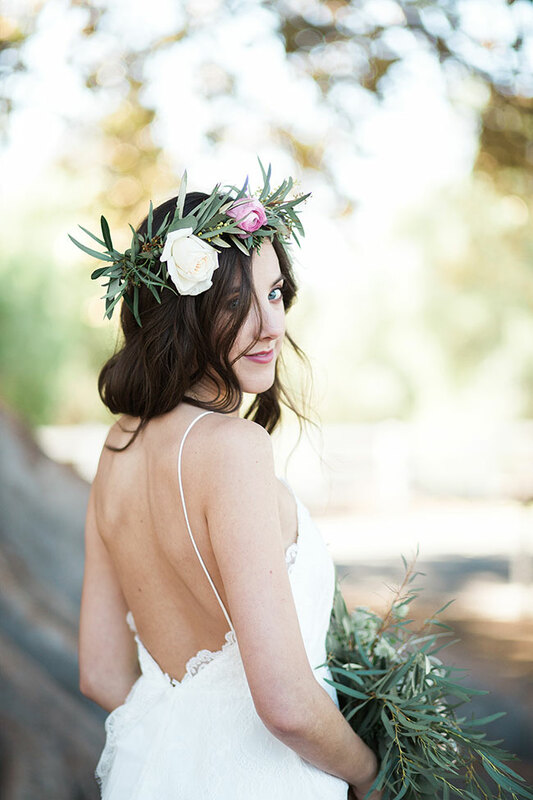 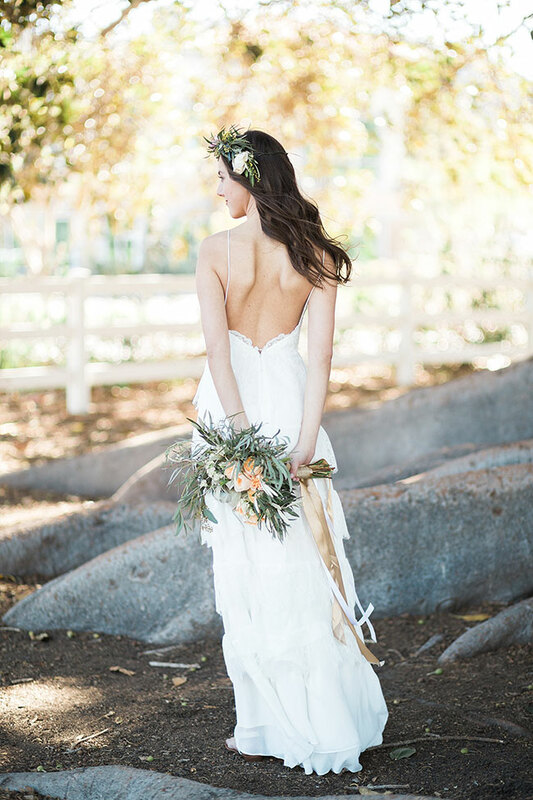 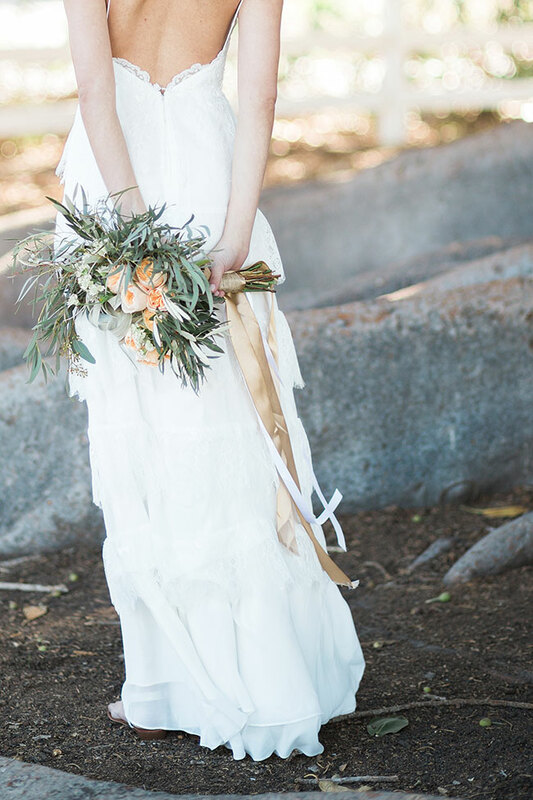 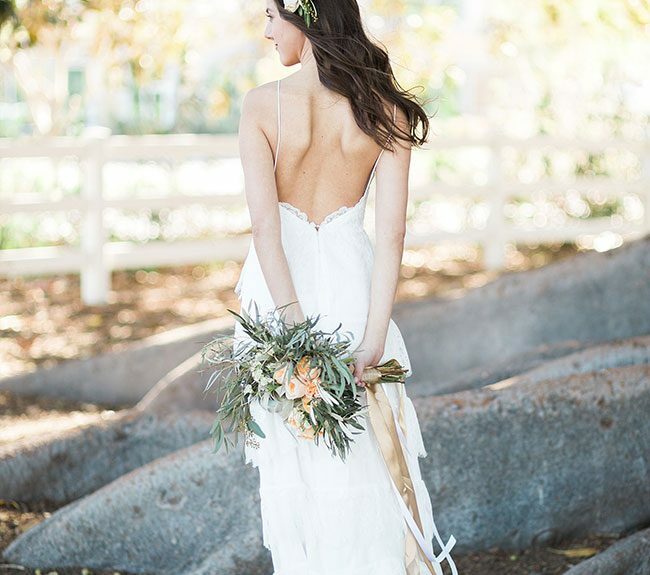 Camarillo Ranch has numerous gardens on site so we wanted to incorporate a wild botanical bouquet and flower crown while keeping to a light and airy color palette of sage, pale peach, and ivory. 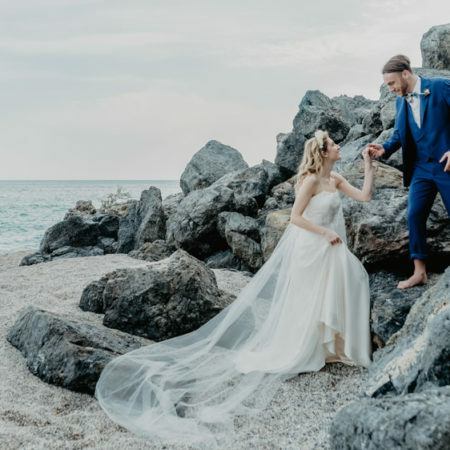 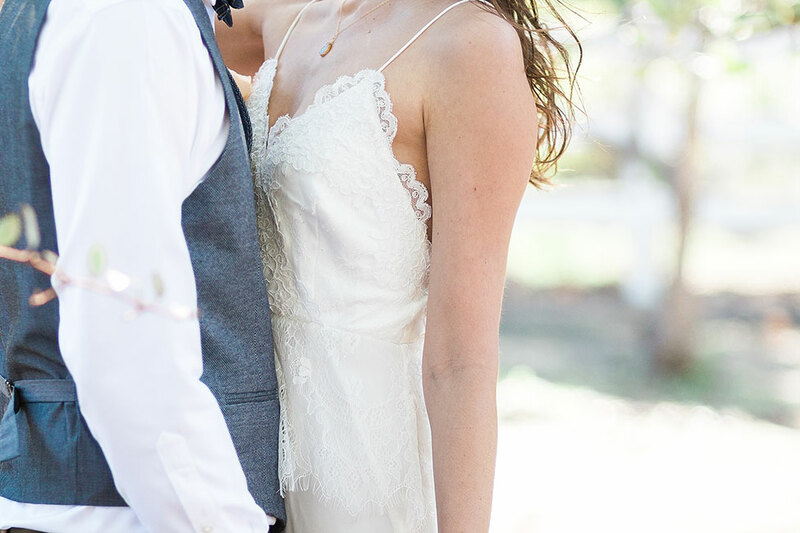 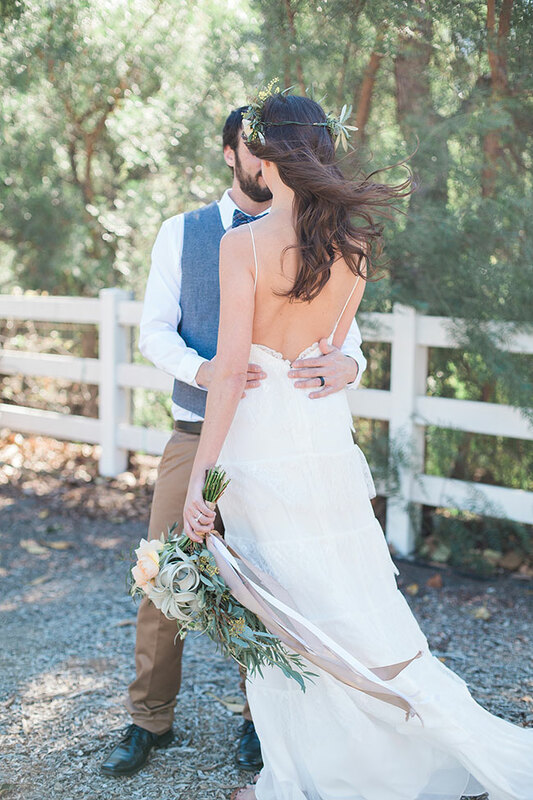 The bride’s dress is tiered lace with a beautiful low back that is perfect for the free spirited bride, designed by Erin Fetherston exclusively for Free People – and for brides on a budget this dress is a steal of a deal at $375! 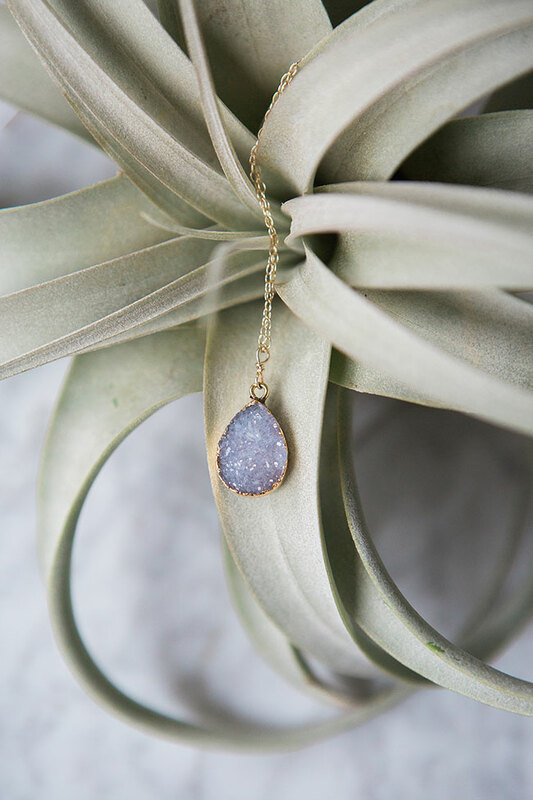 The bride’s gold dipped geode necklace was purchased at Solid Gold Texas in Austin, TX. 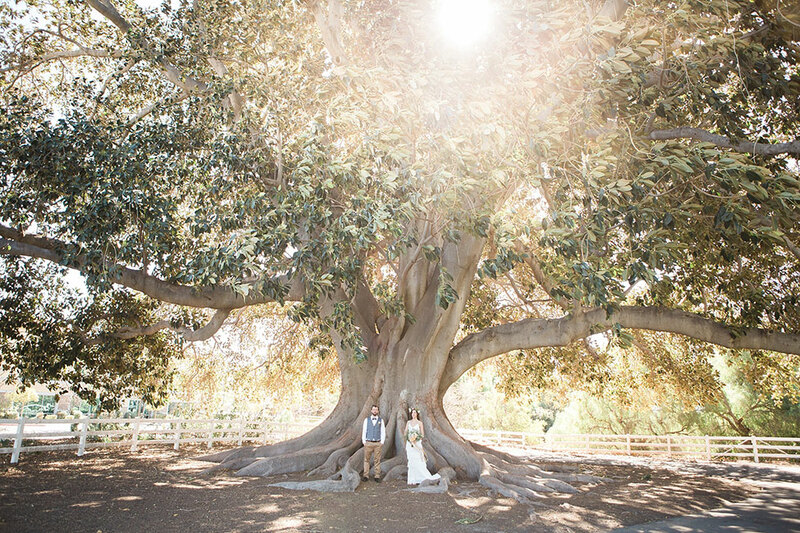 The most breathtaking and unique backdrop for a wedding at the Camarillo Ranch is the giant Fig Moreton Bay Tree. 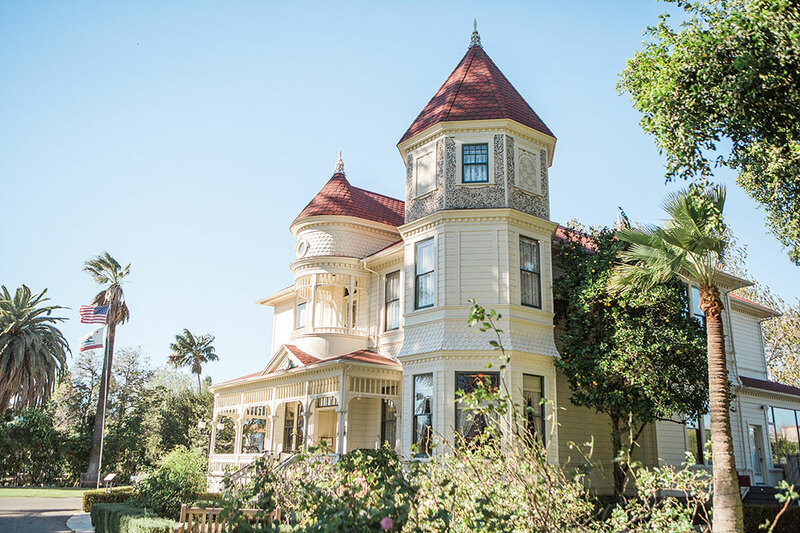 This tree overlooks an expansive lawn surrounded by lush gardens and the gorgeous Victorian home built in 1892. 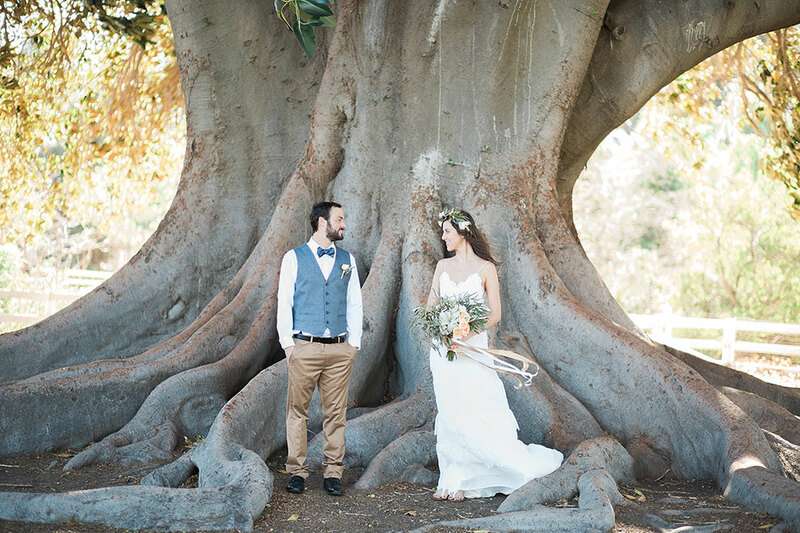 Perfect for couples who want a dramatic and stunning background for their ceremony. 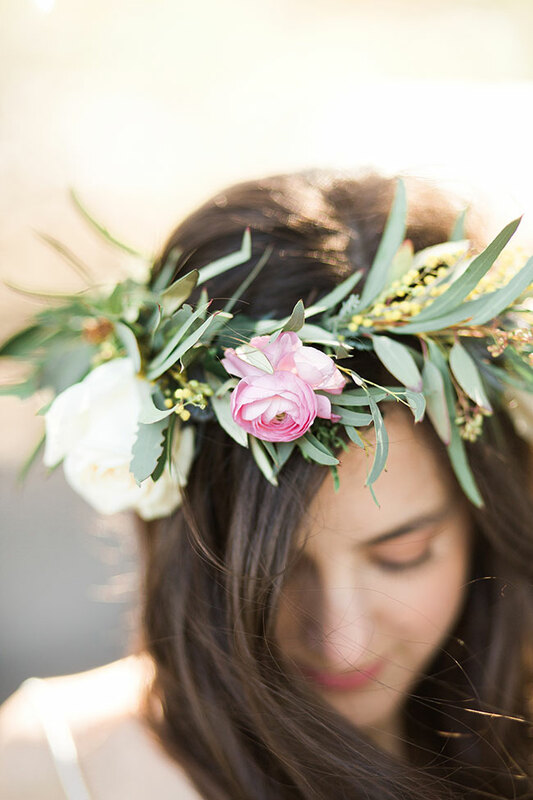 Floral inspiration: My inspiration was bohemian. 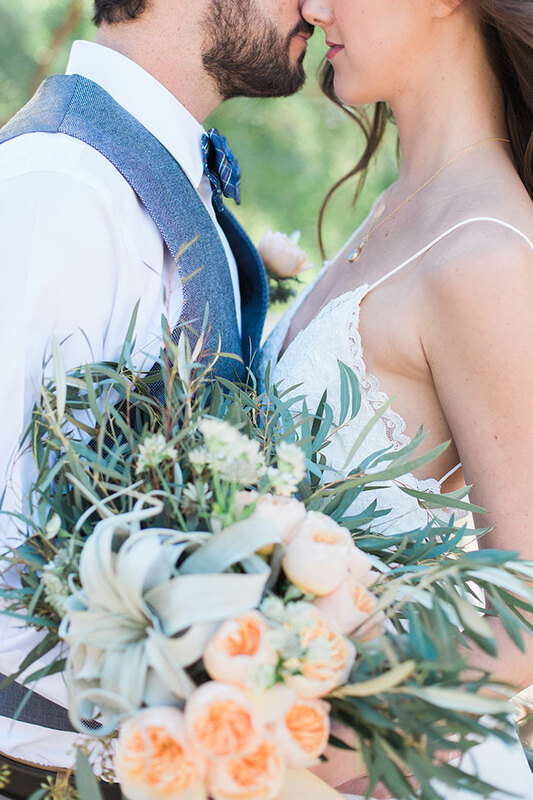 I knew that I wanted something less structured for the bride’s bouquet and more free, making the air plant the main focus. 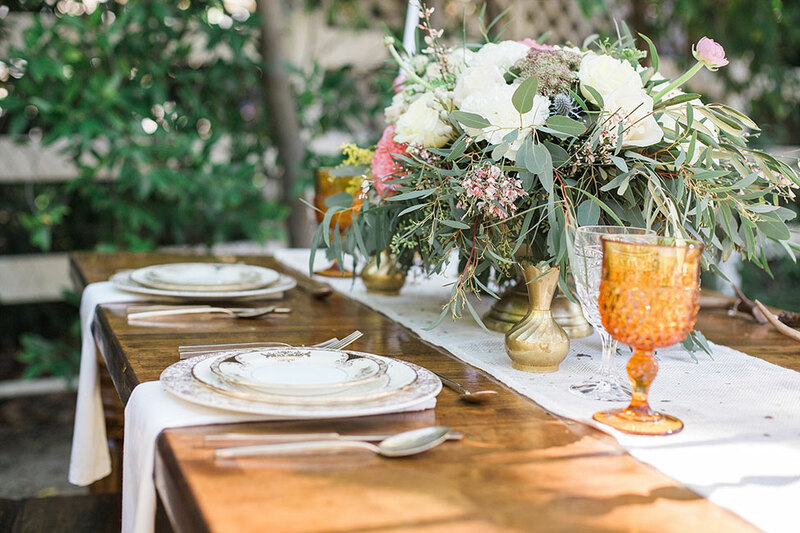 The centerpieces were inspired by the gold vintage pieces used on the table. 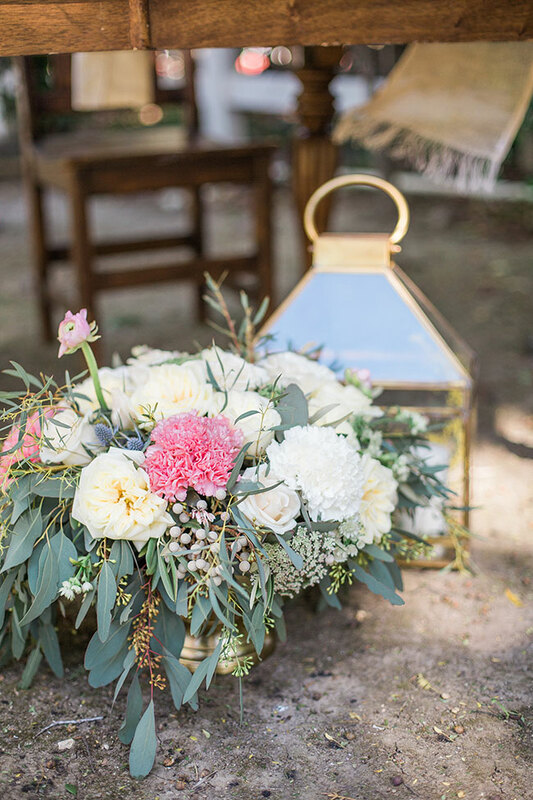 Using a gold rounded bowl as the container inspired my shape of the design, but still leaving room for a few random blooms to be free. 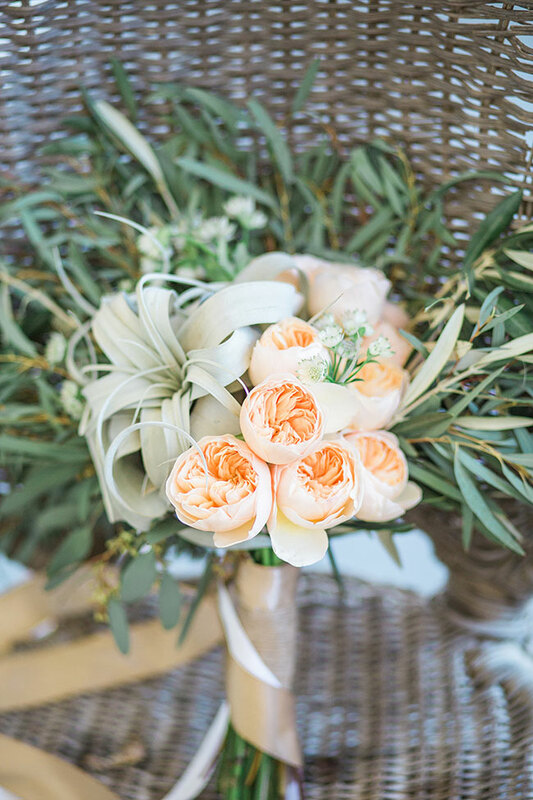 The bouquet blooms consisted of: Rose Gard Juliet Peach, Seeded Eucalyptus, Eucalyptus Willow, Olives branches, white Astrantia, and a large air plant. 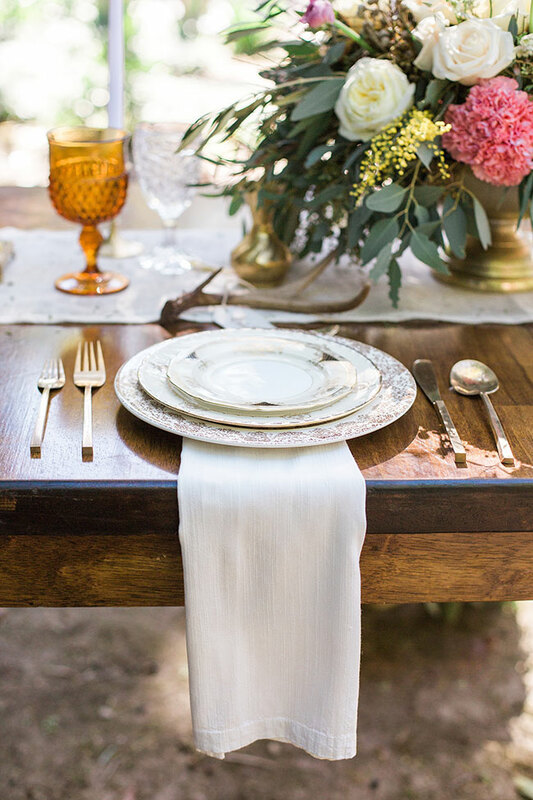 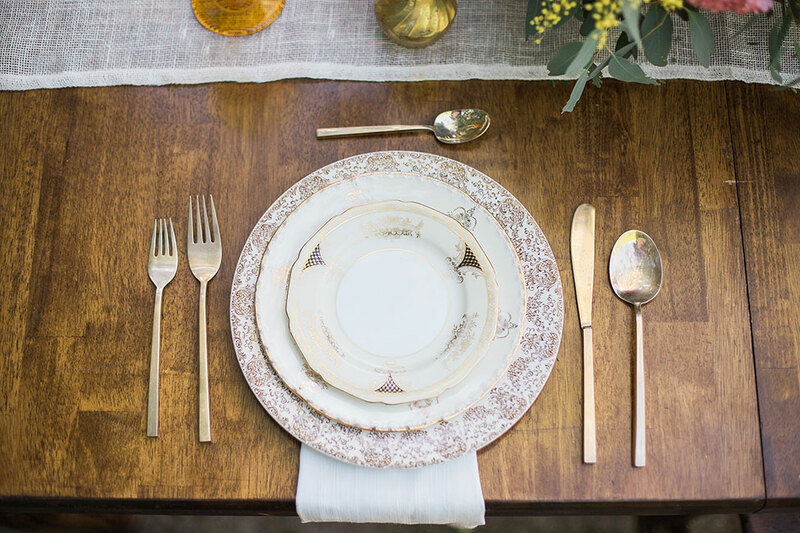 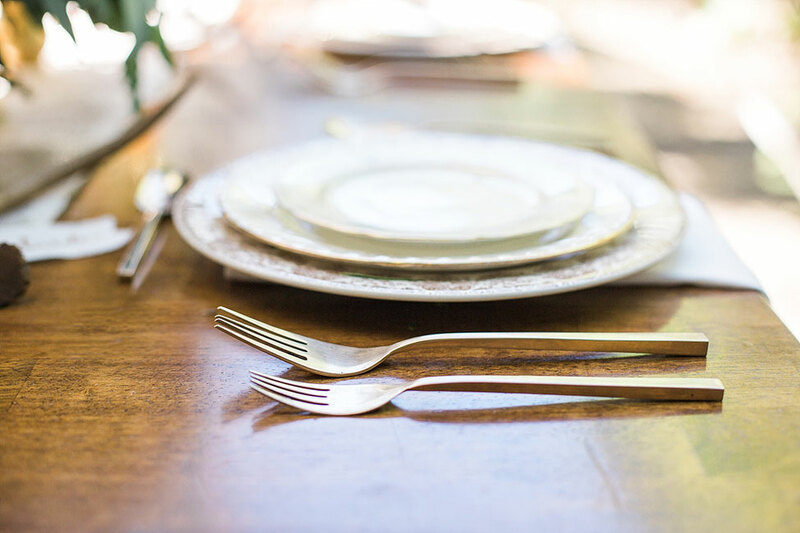 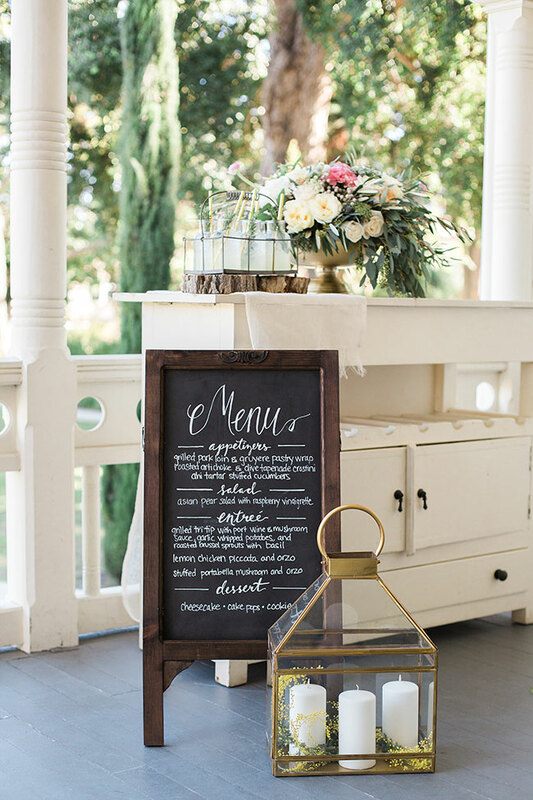 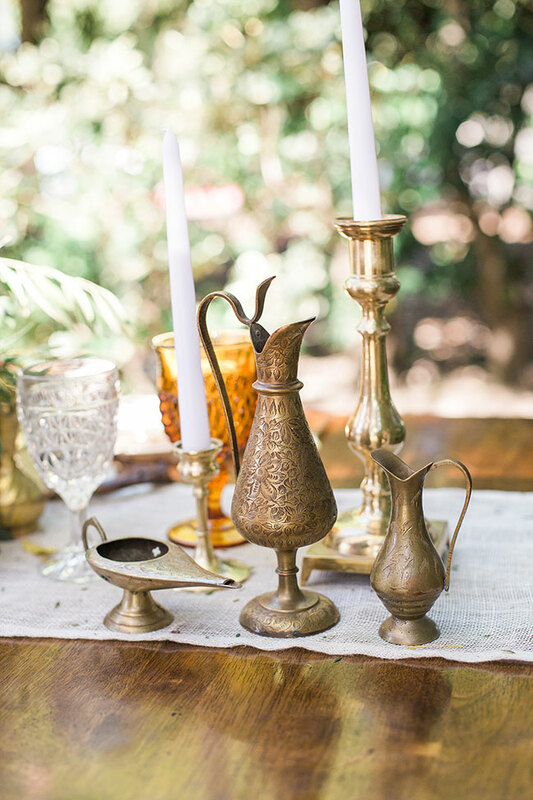 The sweetheart table embodies a romantic bohemian style with the Gypsy china collection from Dish Wish, brass vessels and candle sticks, and antique crystal and amber glassware. 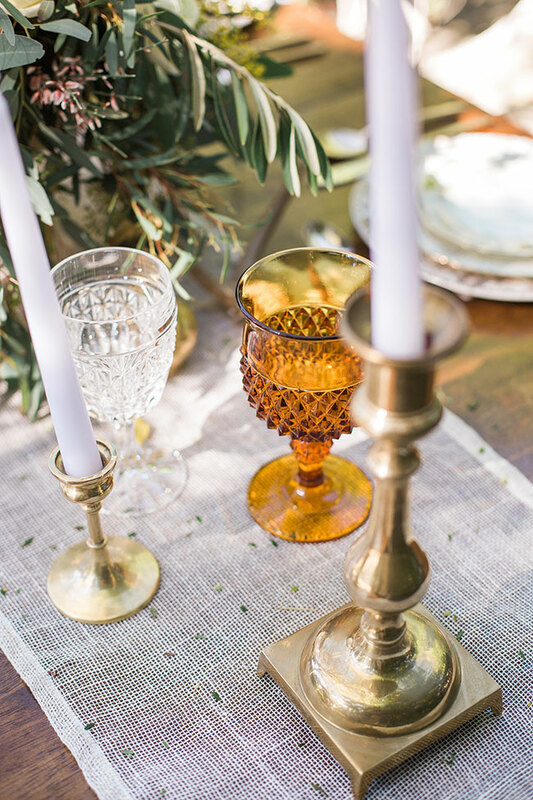 The brass stemware was also from Dish Wish. 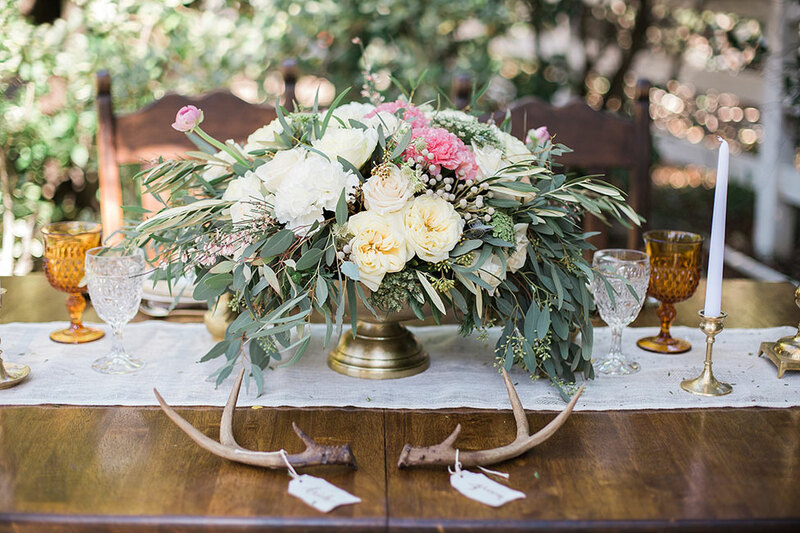 The bride and groom seating cards are tied to deer antlers to add a rustic element, and the linen woven table runner is from West Elm.The table arrangements consisted of: Pink Ranunculus, Queen Anne’s lace (chocolate brown), Fenestra, seeded eucalyptus, white & pink carnations, Rose Venela cream, assortment of light garden roses, and blue thistle.